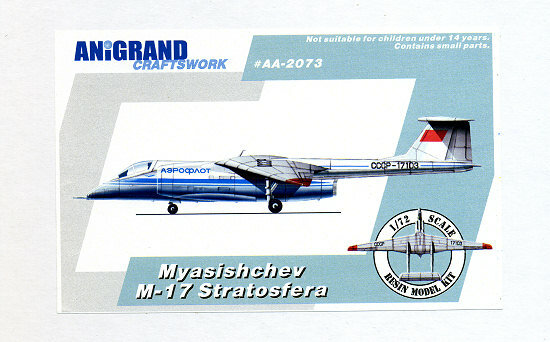 Often called the Soviet U-2, the M-17 was first flown in 1978 following a need to find a way to shoot down US high altitude balloons that were sent over the USSR on prevailing wind. The initial prototype crashed early in the development of the type and was followed by a second example, flying in 1982. It was photographed by US spy satellites and dubbed Mystic "A". The type went on to establish 25 international records for its class and was followed by the twin engine M-55 of which five were built. The later model is still in service when needed for atmospheric tests, the need for a high altitude balloon interceptor going away with the fall of the Soviet Union. Molded in Anigrand's typical tan resin, the kit is in the now-standard multi-compartmented poly bags. In this case, the larger pieces had broken through during all the shipping. In a separate bag is a resin canopy. The airframe parts have the usual problem with air voids, surface crud, blobs of resin in the corners of wheel wells and cockpit, and in this case, an area on a wing center section piece that was not properly formed. There are also places where the resin pour lines have been broken away, leaving indentations that will need repair as well. I have said it before, but I'm not sure why Anigrand cannot produce resin to a higher quality. There are people in Hong Kong, the US and Europe who produce resin kits and parts with few or no molding glitches so it can be done. The majority of these glitches are on the large parts, though I also found an air pocket in the clear resin canopy. The design of the kit is such that one attaches the two inner wing sections together atop the fuselage. This works very well with other kits and makes for an easy and clean connection. The tail booms attach to the back of the wings as in just about every aircraft model of this configuration that I've built. I cleaned up the two attachment points to test fit one and am pleased to say that they fit superbly. As with all boomed aircraft, I'd put as much nose weight into this as I could. The nose gear is short and stubby so should hold up to the weight OK. I would, however, replace the axle with a metal rod, just to be on the safe side. The outer wings are a single piece and fit into a natural seam line. Instructions have been changed to something more useful. Gone are the indistinct semi-photo build sequences, being replaced by two clearly done drawings of the completed kit showing where all the bits are located. I should mention that the booms are designed for a specific side as the horizontal stab is keyed where it attached to the fin. A nice piece of artwork in terms of a two view decal placement guide is given. You get two identical sheets with the areas to cut a few decals shown. Of course, you'd only make a single cut as appropriate to the side you are doing. The aircraft has a grey underside with red wing tips and the rest in white. Anigrand decals, though a tad thick, have always given good service and this one should prove no different. This is another interesting subject kit from the folks at Anigrand. As with many of their other kits, they are for the enthusiast with experience in the type, especially as parts will all need preparation before use. However, if you have the skills and want something that you won't see from anyone else, then this one is for you. I know I'm looking forward to building it.